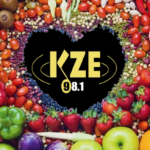 THREE lucky 98.1 KZE listeners will win a $981 Healthy Food Shopping Spree! One winner will be chosen each month from June through August, for a spree at either Sunflower Natural Foods Market in Woodstock or Rhinebeck, or Berkshire Co-op Market in Great Barrington. Pick up your entry form at locations throughout the Hudson Valley, then return your completed entry to the KZE Studios by the drawing date for your preferred grocery market. One entry per person, please. Non-winning entries will be automatically included in the next drawing. June’s drawing was for Sunflower Natural Foods Market in Woodstock on Friday, June 29th. Congratulations to Carla from New Paltz, NY! July’s drawing was for Berkshire Co-op Market in Great Barrington on Friday, July 27th. Congratulations to Bob from Lee, MA! August’s drawing was for Sunflower Natural Foods Market in Rhinebeck on Friday, August 31st. Congratulations to Deborah from Saugerties, NY!